There Are No Shortage Of Stories From People Who Fondly Recall Going To Theaters As Kids & Teenagers To See STAR WARS On Its First Week Of Release 38 Years Ago Back In 1977. I Was One Of Them. Over the years, the emotional wonder of the Star Wars saga (while still fresh in my mind), has given way to a more rational assessment of the film, and how it has become such a huge part of our popular culture. I began investigating the Star Wars franchise focusing my analytic lens on aspects of the film’s production and Disney’s studio business in general, that has made it such a stupendous financial success as well. Take this tour with me, of an idea that began in 1973, that has now lasted over 38 years so far, and promises to go on just as longer into the future. And If You Feel Nostalgic Enough To Recall The Effect This Film Had On People Then, Here Are A Few Reviews Of The Original 1977 Star Wars Release. 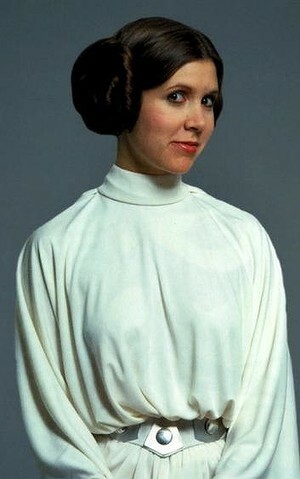 Carrie Fisher as Princess Leia. 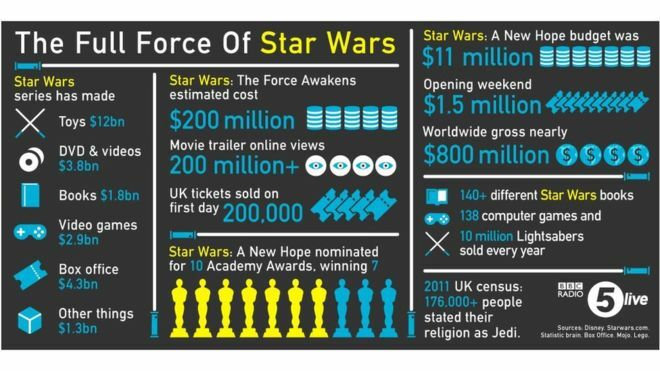 “STAR WARS (EP.VII) – THE FORCE AWAKENS” cost $350 million to make and market, and it’s already reaped $800 million in global ticket sales. It shattered both the single-day gross revenue record, becoming the first film to pull in $100 million in a single day, and raked in $238 million in North America alone on Day 1. The film is projected by analysts to earn upwards of $1.95 Billion in the final global tally. The Film Officially Opened In 4134 Theaters Across The United States, And As Of Writing This It Was Still Opening In An Increasing Number Of Theaters Internationally. The strategy was to release the movie in many theaters and simultaneously in many countries. (China was not included). The movie opened in what’s called day and date (also known as concurrent release) in many countries, making it like a global event. The movie was made available both in 3D and 2D formats, and making sure that there are enough showings in the theaters for both formats. It was a clever decision and a big indication of strategic marketing. The logic being if many people came to the theater, and they saw that a sold out 3D version, they may catch the movie in a traditional 2D format, and then come back later to watch it again on their preferred 3D version. Getting the same product in two different formats enhances each other, and this a feature of Disney’s marketing strategy we did not see in previous movies. Costly tickets for large format and 3-D screens played a key role in the massive box-office haul. 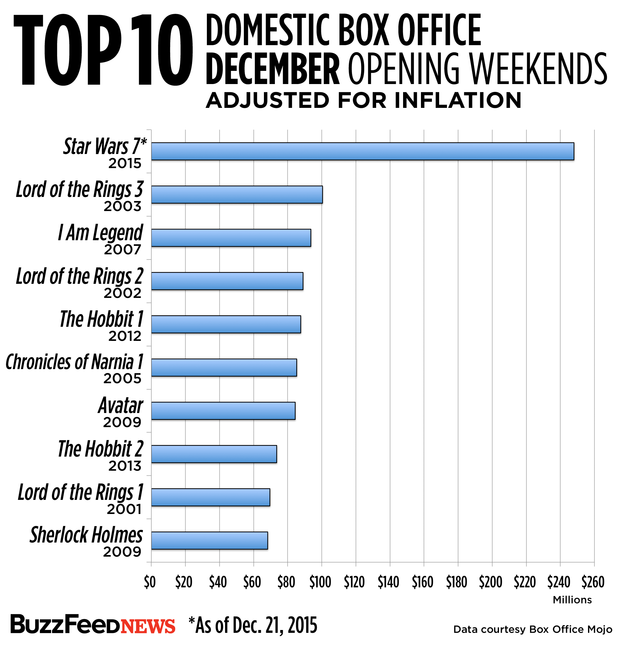 According to Disney, 49% of the domestic theater audience saw the movie in a more expensive, premium format. 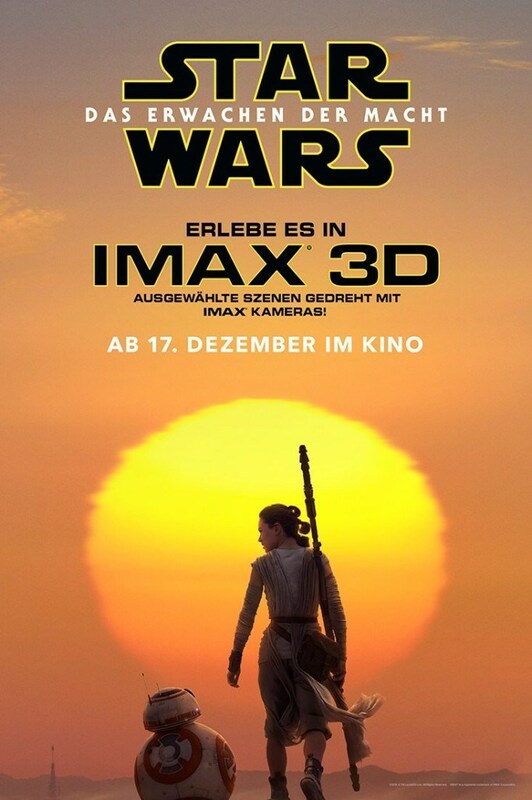 Based on pre-booking data, 90% of the advance tickets bought in Germany, have been for the 3D version. France expects to sell at least 10 million tickers beating its previous record from the previous installment of the franchise. In South Korea, it will screen at premium IMAX and its 4DX screens, the state-of-the-art theaters equipped with motion-effects chairs and environmental effects tuned to the on-screen activity. 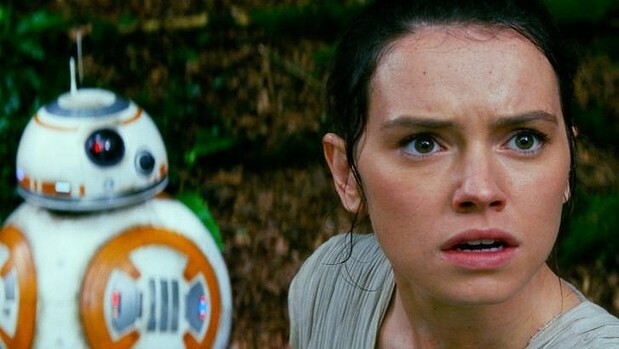 “Star Wars: The Force Awakens” won’t be released in China until January 9, as the 2015 quota for imported films was exhausted by early December. That leaves Chinese local films to rule the box office during the most lucrative month of the year. The China release on Jan. 9 will be the last international opening. This is because previous six “Star Wars” films were not released theatrically in China, meaning today’s key movie-going demographic should be relatively unaware of the franchise. IMAX Corp. sold $48 million in tickets globally, nearly doubling its prior record for an opening weekend (and this excluding China !). Two weeks before release in the U.K., 238,000 tickets had been sold already by just one theater chain Vue. Cinemax had a record pre-sales for the film selling more than 40,000 tickets within 24 hours, the highest number of pre-sold tickets in the exhibitor’s history. Meanwhile in Japan, the Toho Cinemas chain reported that when they began taking online orders for advance tickets on Nov. 18, servers went down and all opening-day tickets were sold out on the first day. And for the three astronauts who were scheduled to blasting off on the Soyuz rocket headed for the International Space Station just two days before release of the film, a projector already in orbit has been cued up to Episode VII when they get there. Many of today’s astronauts were likely inspired by the 1977 franchise and its legacy. 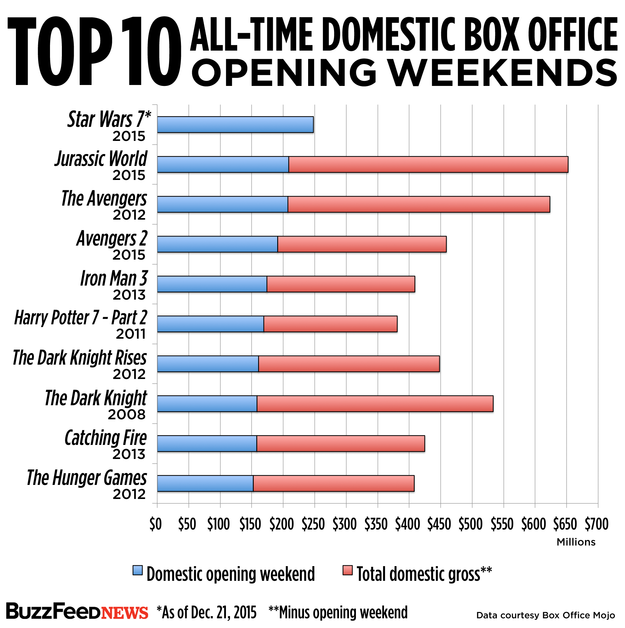 Audience Demographics: On the Friday of release, 63% of the audience was male, but by Saturday that percentage dropped to 58% as the fanboy-driven early crowds started to broaden, according to Dave Hollis, executive vice president of distribution at Disney’s movie studio. The research firm Rentrak also gathered audience data from 20 markets across the country which showed 70% of the typical audience to be male, with the biggest group attending to be in the 18-34 age groups comprising 34% of total attendees. Bringing More Butts-On-Seats: The only finite resources for a movie like The Force Awakens are screens and seats: you cannot force more butts into one movie seat at one time. So if it can’t be done spatially, better it be done temporally, by exponentially increasing the number of available screenings. The Force Awakens is being seen at weird, sci-fi-like times of the day – 3am screenings, 5am screenings – and in as many as eight screens per multiplex, forcing other movies into split screenings and smaller, pokier rooms. Even a film-maker as respected as Quentin Tarantino whose new film release of The Hateful Eight (expressly designed for large screens and sumptuous exhibition spaces like Hollywood’s Cinerama Dome) – found themselves strong-armed out of plum, state-of-the-art screening venues by Disney programmers wielding ridiculous amounts of bribery-cash and veiled threats about access to future releases. The trailers used for the film were what’s called peering trailers. They got people very interested in the movie but they did not disclose much of the content and the storyline, so they were very creative in generating these teaser trailers that got people to the movie theaters. They also made the Thursday showings around the country … like a special event. 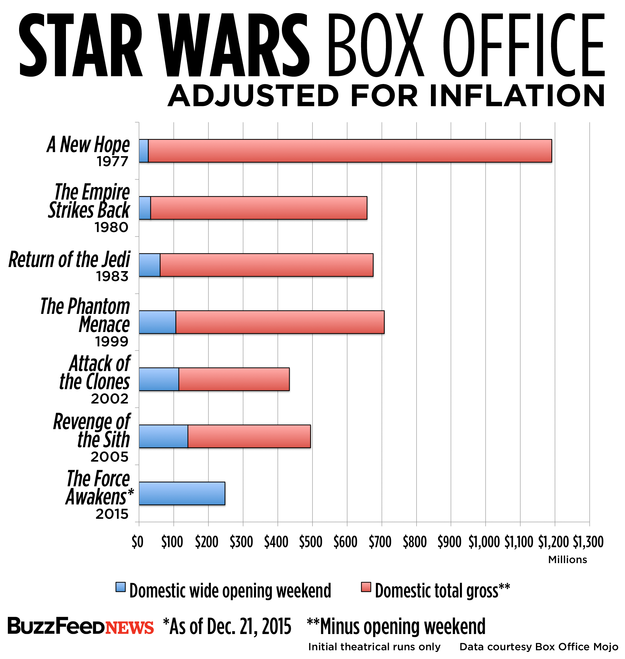 Interestingly, there are some box-office metrics where The Force did not Awaken for this Star Wars franchise film. The top honor here still stays with another Disney film THE LION KING which swept box offices back in 1994. Star Wars For Disney Is Not Just A Movie Series; It’s A Launching Pad For A Whole Bunch Of Business Beyond The Screen. When Disney bought Lucasfilm for $US4.1 billion in October 2012, it probably got a deal of the century. Disney’s ongoing plans for the franchise include not just the new trilogy – episodes VII, VIII and IX, to be released in 2015, 2017 and 2019 – but three other spin-off movies, to be released in 2016, 2018 and 2020 (the year the studio regains full rights to all except for the first film, which is set to remain with Fox forever). There are also major theme-park attractions planned, plus computer games, television series. Disney Has Put A “Productive Lifespan” Of 40 Years On The Franchise. 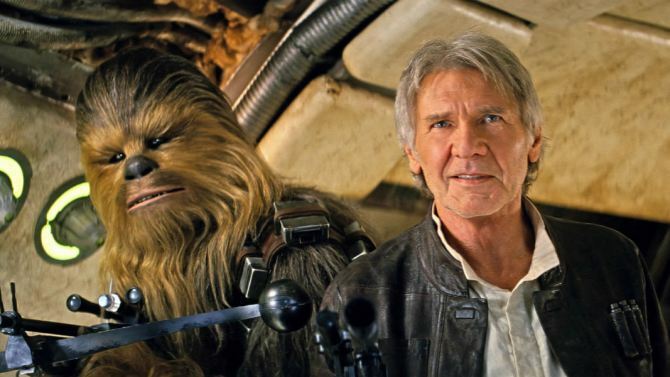 By the time it has eked the last dollar out of it, Star Wars will be almost 80 – older even than Harrison Ford, the 73-year-old returning as Han Solo after 30 years away from the series. 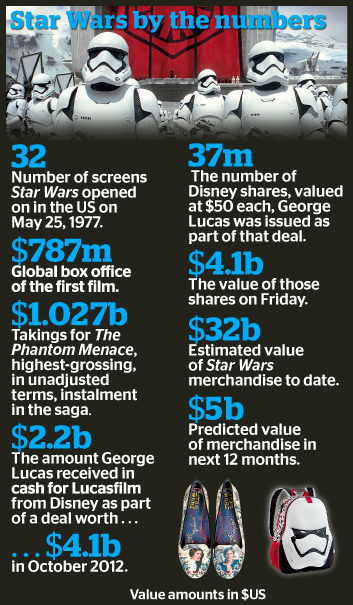 Factor in the merchandise (value to date, more than $US32 billion), the theme park rides (amusement parks brought in more than $US15 billion last year for Disney, more than twice as much as the movie division), and spin-offs (The Force Awakens is the first of six planned films; there are books, comics, TV series and computer games too) and you can see where the real value lies. This is typical Disney strategy. Disney leveraged the ecosystem of licensing and in particular signed up non-traditional partners such as Cover Girl cosmetics and Zales jewelry, among others. Pepsi, Burger King, M&MS/Mars, Hasbro and Kellogg’s are all signed up for the tie-in frenzy, while the shelves of Target, Walmart and pretty much every department store chain in the nation (world) groan with Star Wars-branded products. And personal appearances by stars and director JJ Abrams extend from Good Morning America to The Tonight Show and every single second of the day in between. White House news conferences have been attended by imperial storm-troopers and the president himself got a special White House screening. The marketing strategy for “The Force Awakens” is merely the latest iteration of this formula, supported by all newly available online platforms for advertising, fan-stoking and tie-in merchandising (This didn’t really come into play until the widely derided cuddly toys of Return of the Jedi in 1983). Market-saturating ubiquity in promotions is now possible in ways it simply was not in 1977, but the broad principles still apply. Disney launched toys before the movie release and before the critical holiday shopping season, making that an event in and of itself by labeling it “Force Friday,” and bringing key partners like Amazon, Target and Toys “R” Us. The brand partnerships were big and bold and really pinned their only hopes for holiday marketing campaigns on Star Wars. Covergirl, Duracell, General Mills, HP, Subway and Verizon launched major efforts and timed those launches in a way that engaged consumers and fans with products and ads that provided as much unique new content, continuous, more organic effort online and on social platforms in particular. Events & Product-Marketing Campaigns. The promotional campaign that started with an 88-seconds piece of footage Disney first teased more than a year ago 2014, was then followed by a longer second teaser in April 2015. Finally the official trailer debuted in October 2015 along with countless TV spots. The cast made the rounds on the talk show circuit and timed it all perfectly. Even the normally reluctant Harrison Ford was cooperative, and playfully so. In print, Disney fed the promotional machine first with original content by way of new novels and comic series—which told the story of what has supposedly happened in the 30 years between Return of the Jedi and The Force Awakens. Many of the comics focused on single characters, with exclusive series dedicated to Vader, Princess Leia, Chewbacca and Lando. On top of that, Disney meticulously controlled and timed the releases of exclusive interviews and photos with publications like Vanity Fair, Entertainment Weekly, Rolling Stone, Fortune, Empire and Time. Each new set of photos gave the audience something new to talk about. 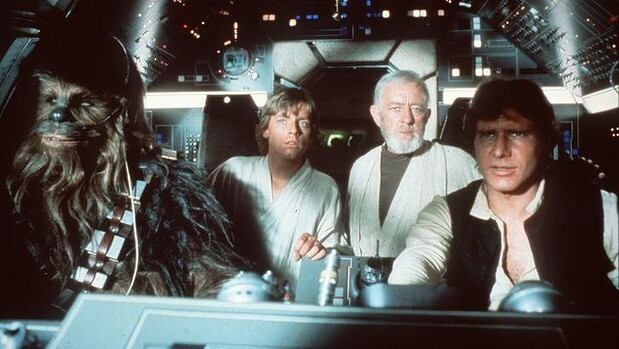 Millennium Falcon again became a subject of discussion following a photo-feature shot by celebrity photographer Ann Liebovitz. In the digital and mobile space, where content plan ran at a different speed, things were much faster, much more conversational and fluid. While Starwars.com played the content hub; social platforms — Facebook, Twitter and Instagram, a super cool Tumblr blog and even a well-managed presence on Google+ acted as the spokes. There were new pieces to the story revealed multiple times a day. Let’s not forget that brands have to earn their way into users’ social feeds. Star Wars earned its way into those feeds and the right to stay by publishing and sharing great content. A new app was launched, games arrived, all feeding elements of the overall story Disney was telling. 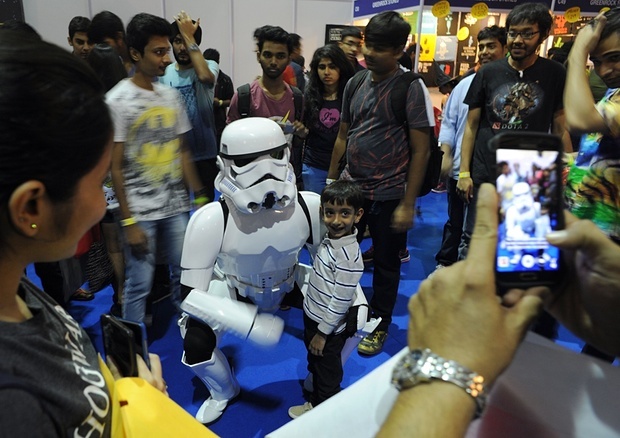 Events like Comic-Con and Star Wars Celebration were used to further feed the frenzy. Disney streamed live on YouTube, revealing cast members and characters, teasing future films, and essentially bringing fans into the experience as if they were family. Books, comics, and – the jewel in the crown – official licensed merchandise. A great example of branding was bringing toys to the marketplace before the movie was actually available. 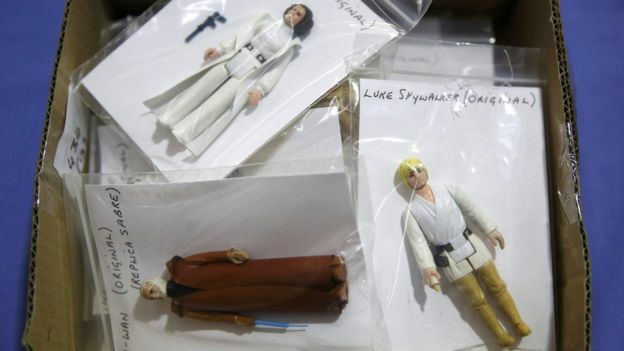 Typically, the merchandising, the toys — these things typically come after the movie. In the case of Ep. VII, Disney preceded with the merchandise, made them available, advertised and showed them before the release of the movie so they came as promotion for the movie as opposed to the more traditional way where the merchandise comes later as a supplementary income. 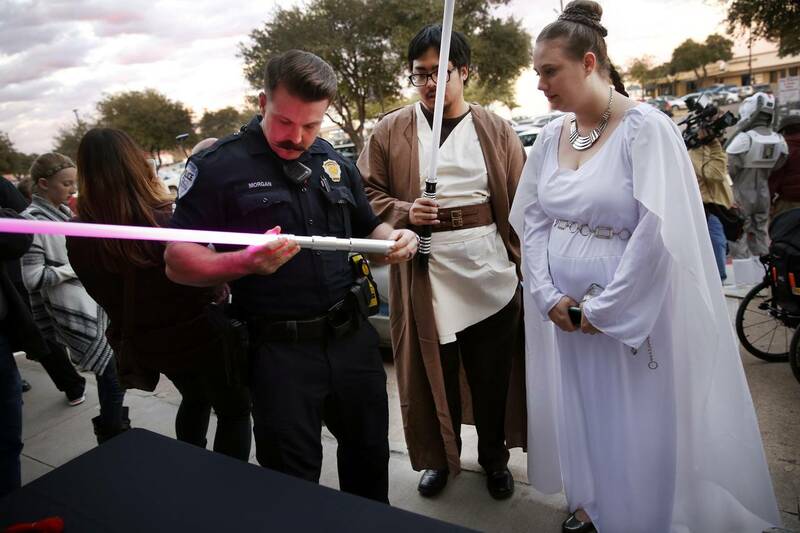 A light saber is inspected outside a Texas theater. In August, Macquarie Securities analyst Tim Nollen​ predicted merchandise linked to The Force Awakens could top sales of $5 billion in the first year alone. About $500 million of that will go to Disney in license fees. In September, Disney launched ‘Force Friday’, where merchandise from “Star Wars: The Force Awakens” went on sale globally. It was preceded by a global live unboxing event broadcasted on YouTube from 15 cities around the world, where highlights of the new product range were officially unveiled. 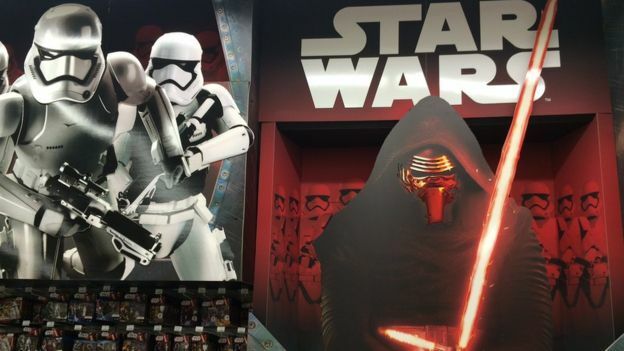 According to Mykola Golovko, senior analyst for Toys & Games at Euromonitor, “The highly-anticipated [“Star Wars” feature film] has precipitated an unparalleled array of licensed products spanning toys, apparel, housewares, even jewelry. dedicated Star Wars destinations in all Toys”R”Us stores nationwide (the majority of stores feature 100 square feet of linear shelf space), offering a one-stop-shop for Star Wars figures, construction sets, accessories and more. In August, Macquarie Securities analyst Tim Nollen​ predicted merchandise linked to The Force Awakens could top sales of $5 billion in the first year alone. About $500 million of that will go to Disney in license fees. Another report from IHS Maritime & Trade said containerized toy imports to the U.S. are expected to increase by 10.9 % on-year by end of 2015. That’s an equivalent of 581,053 20-feet long shipping containers worth of toys, boosted by demand for Star Wars merchandise. In contrast, toy imports to the U.S. saw consecutive on-year declines between 2011 and 2013, before seeing a 3 % uptick in 2014. To get a sense of how valuable merchandise might be, consider this: The six movies so far released have taken about $4.4 Billion in gross theatrical revenues globally. According to Chris Taylor, author of How Star Wars Conquered the Universe, the franchise has so far sold about $32 Billion worth of Star Wars merchandise in stores & online. “PULL-THROUGH” REVENUES FOR BACK CATALOG A spike in a franchise back-catalog typically only occurs in a one to two month period around the movie launch date. In the case of Star Wars Episode VII, digital sales of the previous six movies have been growing rapidly for nearly five months. The three oldest movies, Episode IV, V and VI were the most popular titles, although all six movies saw a considerable spike in downloads from November 2015 onwards. To make way for “Star Wars,” Disneyland is about to launch its largest expansion ever, and plans to shut down a significant chunk of its Anaheim theme park in Orange County, home of the Disneyland and Disney California Adventure. In Tomorrowland, the Space Mountain and Star Tours rides have been overhauled to include special effects borrowed from the recently released movie “Star Wars: The Force Awakens.” The Galactic Grill eatery now sells treats inspired by “Star Wars” characters, such as a dessert dubbed Darth by Chocolate and the Cheese 3PO Burger. EP. VII : DOES THE FINAL PRODUCT STAND UP TO EXPECTATIONS? Where The Force Awakens Stepped Onto New Ground. J.J. Abrams’s work to make the “Star Wars” universe look vastly more inclusive is clear throughout “The Force Awakens.” There are women and people of color in the cockpits of X-Wings and at battle stations in both Imperial and Resistance facilities. Leia Organa (Carrie Fisher) is still fighting as part of the Resistance, but she’s stepped into a leadership role previously occupied by a number of men. During one climactic sequence when the evil First Order destroys a series of Republic-controlled planets, the extent of what’s happening is communicated through a long shot of a woman of color who is watching destruction rain down on her and her companions. It Also Stood On Shoulders Of The Original Star Wars To Succeed. 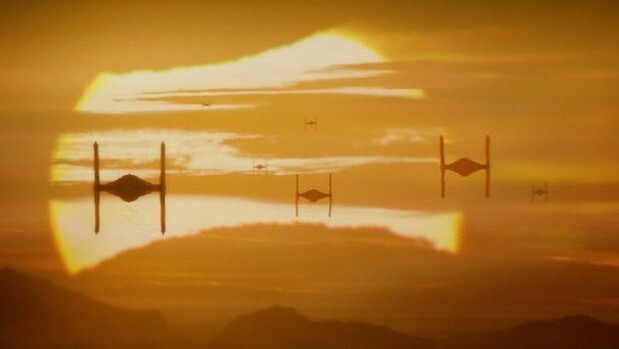 “The Force Awakens” was designed to emulate the original trilogy in style and substance. It returned stars Harrison Ford, Carrie Fisher and Mark Hamill to their original roles, while introducing a new cast of Jedi Knights, storm troopers and imperial officers led by Daisy Ridley and John Boyega. Star Wars: The Force Awakens has been that it’s a baldfaced rip-off of the original Star Wars, now known as Star Wars: Episode IV — A New Hope. Force Awakens is more a product of the same market logic that gave rise to the Marvel Universe films—a logic that rewards emulation and nostalgia above all; reusing ideas, characters, and narrative arcs that have already proven lucrative—than it is of the imagination that launched the series nearly four decades ago. It Captured The Look-and-Feel Of The Originals. Luke’s aunt and uncle’s charred bodies standing in for that slaughtered village, Mos Eisley cantina for whatever that forest planet saloon was).We’ve been served up a pretty unoriginal reboot that adds few, if any, new ideas to our greatest commercial mythology. 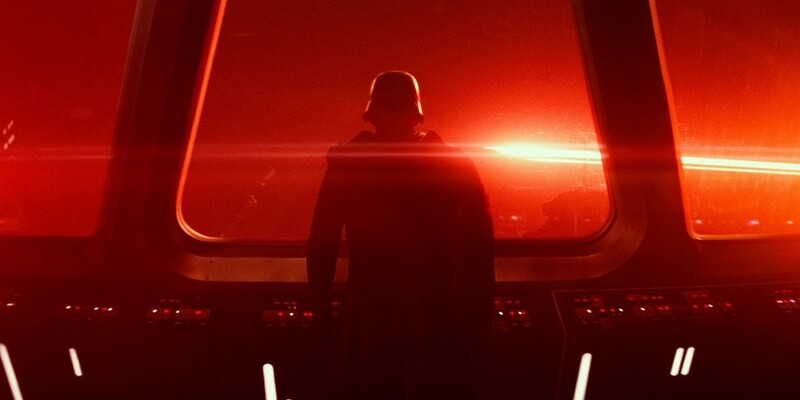 Force Awakens is the most derivative Star War; it’s almost a scene-by-scene remake of A New Hope. We watch imperial troops from a galactic empire pursue a robot with stolen plans across a desert planet and into the care of a young loner with mysterious powers who was then aided by a wisecracking smuggler and his space ape in a seedy interstellar tavern where cheerful aliens play catchy orbital music. They sought not to create full-scale retreads of the original Star Wars but to expand and enrich it; the films were bursting with color, imaginative city-worlds, clone armies, duels on volcano planets, and an explanation of the fall of a democratic intergalactic society and the rise of an autocratic Empire. 1) Rey is basically Luke Skywalker all over again. The new trilogy’s hero, the plucky desert planet dweller Rey (Daisy Ridley), is basically Luke Skywalker with one character trait changed — instead of wanting to leave her planet of Jakku, as Luke wanted to leave Tatooine, she wants to stay. She’s an untrained young woman, powerful in the Force, who turns out to be naturally gifted at a bunch of things. Rey’s flashbacks:They begin with her hearing a child’s voice, which draws down to the basement and leads to her finding Luke’s lightsaber. When she touches the saber, she suddenly has a series of visions: She sees Luke’s mechanical hand reaching out to R2-D2—presumably, as we later learn, shutting him down. Next, she sees Kylo Ren and a small group of black-clad figures standing over a field of what appear to be corpses—a brief glimpse of the Jedi slaughter that likely prompted Luke’s self-exile. And then she sees herself: a young, screaming child, being pulled away as she reaches desperately toward a spaceship flying off in the distance. In other words, Rey was left behind on Jakku—hidden, perhaps, like Luke and Leia were as babies—after the massacre, possibly to preserve her life. Rey meets Han Solo roughly the time Luke met Obi-Wan Kenobi. 2) The First Order Is Nothing But The Empire Itself. The First Order fulfills the role of the Rebels, and its strike against the Republic is the equivalent of, say, a terrorist cell nuking a major American city. The Republic is in charge; the First Order aims to depose it. 3) Kylo Ren is Darth Vader (& for no real reason). So Is Snoke the Emperor. Kylo Ren is a rewrite of Jacen Solo, Han and Leia’s son who falls to the Dark Side and kills Luke’s wife, Mara Jade. 4) Han’s Death From Kylo Ren’s Hands Is Very Similar To Obi-Wan’s Death. The various times Luke faced off with Darth Vader in the New Hope sequels. But the overall backstory and effect on the rest of this particular saga have heavy echoes of Obi-Wan falling to Darth Vader. Obi-Wan and Darth Vader went way back, to when they were best pals, just as Han and Kylo go way back to, uh, Kylo’s birth. Han’s death is watched from afar by those who’ve come to accept him as a grizzled old mentor, just as happened with Obi-Wan in A New Hope. 5) Lots & Lots Of Other Bits That Ape The Original Film. A New Hope had a cantina, so The Force Awakens has a cantina. 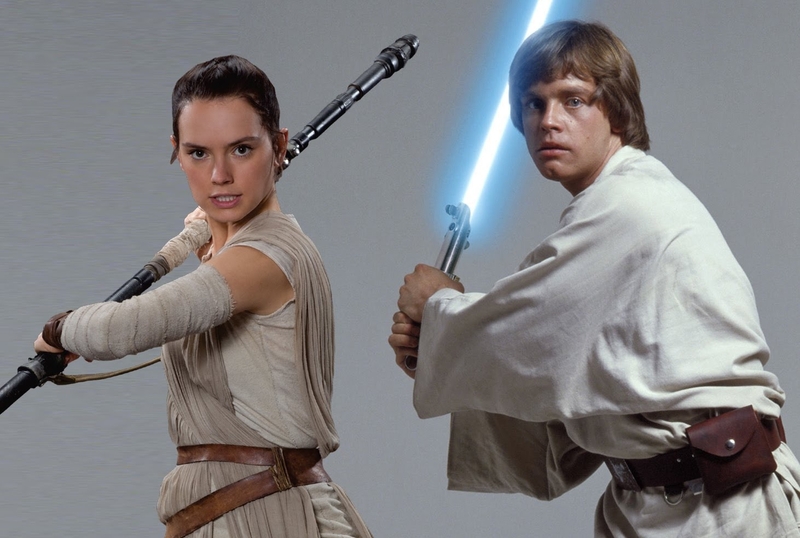 Leia is in need of finding in A New Hope, so Luke is in need of finding in The Force Awakens. 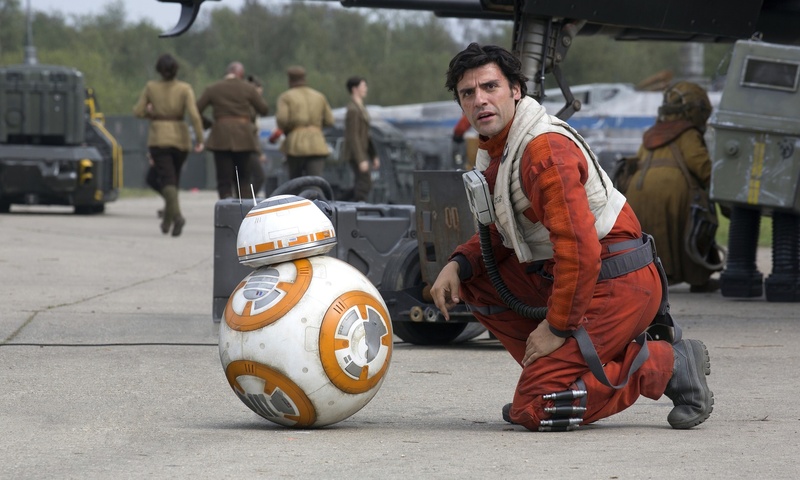 The new droid, BB8, for instance, is the greatest character in the history of cinema. in copying A New Hope so exactly, The Force Awakens doesn’t exactly suggest how this trilogy is going to stand apart from the original trilogy. 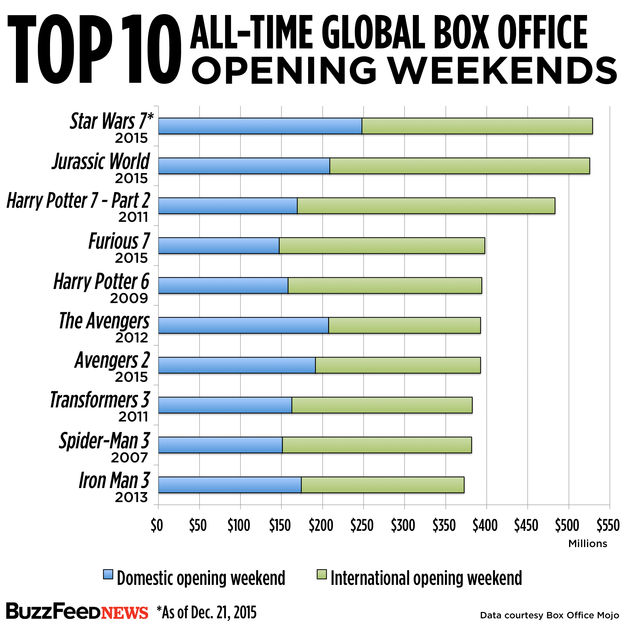 The film cost $350 million to make and market, and it’s already reaped $517 million in global ticket sales. It shattered both the single-day gross revenue record, becoming the first film to pull in $100 million in a single day, and raked in $238 million in North America alone. Harrison Ford (Han Solo) came away the big winner on Disney and Lucasfilm’s sequel with a paycheck upwards of $10 million and as high as $20 million to reprise his role of Han Solo. Harrison Ford reportedly earned somewhere in the neighborhood of $10-$20 million for the film. Mark Hamill (Luke Skywalker) and Carrie Fisher (Leia Organa) each netted in the low 7-figure ballpark. 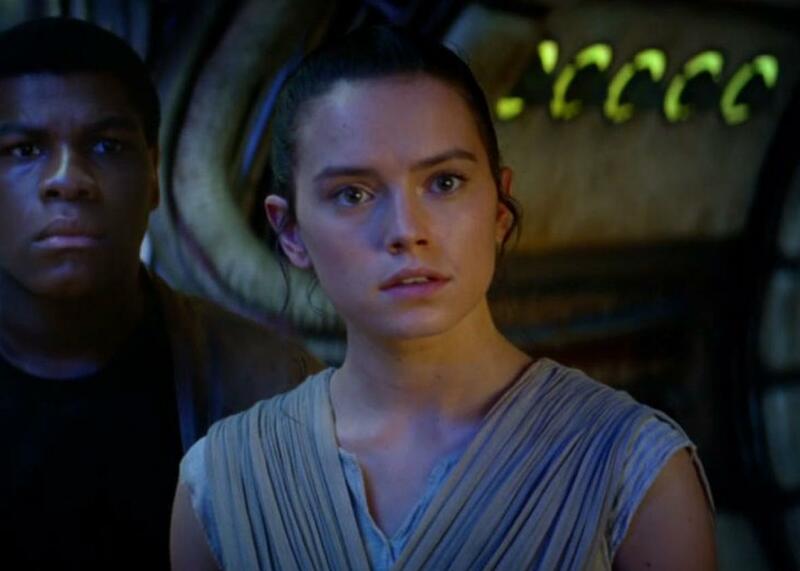 The film’s two main stars Daisy Ridley (Rey) & John Boyega (Finn) had never appeared in a large-scale film before and therefore earned what’s basically a standard, mid-level tech engineer salary in San Francisco: $100k-$300k. The figures, published by Variety, are slightly lower than what co-stars Adam Driver (Kylo Ren) and Oscar Isaac landed, primarily Because Driver and Isaac had fixed quotes from previous film and TV work, their deals were negotiated higher compared to Boyega and Ridley, who, for the most part,. Adam Driver and Oscar Isaac received offers of mid- to high-six figures meanwhile. Disney made a decision in 2014 prior to casting the new roles to create a “legacy pay scale” intended for talent like Ford, Fisher and Hamill, who had previously been a part of the “Star Wars” universe, and general pay scale for actors that would be appearing for the first time. 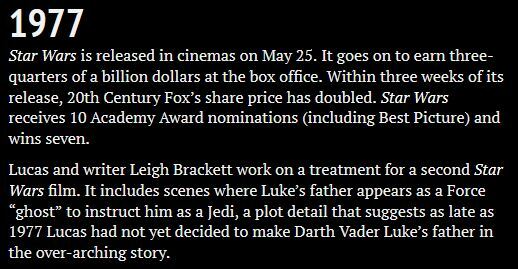 Hamill and Fisher’s salaries are expected to rise in upcoming installments as their parts grow with each film. As for the younger talent receiving lower salaries — it’s a fairly common practice in today’s market for newer actors, especially with so many negotiations involving back-end box office bonuses. The salaries don’t include back-end bonuses from the pic’s box office haul that in a rare case doesn’t even kick in till the film crosses $1 billion worldwide, and following the success of “The Force Awakens,” deals are expected to be renegotiated before the next films get underway. While it’s also worth noting that it’s standard for large scale, multi-installment features like this to grant stars a monetary bonus, in the case of “The Force Awakens,” the cast won’t receive these extra paydays until the film crosses the $1 billion earnings threshold. (For comparison’s sake, “Hunger Games” star Jennifer Lawrence took in $500k for her first installment, in addition to bonuses for the film’s success, and “Twilight” stars Robert Pattinson and Kristen Stewart each earned $2 million for the initial film (pre-bonuses). HOW IMPORTANT IS STAR WARS FOR WALT DISNEY COMPANY ? Star Wars” is a small part of the Disney empire. Star Wars” is epic, it just not as epic as Walt Disney. Disney reported revenue of $48.8 billion over the past 12 months. That means “Star Wars'” first weekend of revenue is just 1% of Disney’s total revenue over a year’s time. Even if the film generates $1.95 billion in global revenue in the box office, as expected by Goldman Sachs, that would be just 4% of Disney’s annual revenue. The Film Business Doesn’t Drive Disney’s Business. There’s no question Disney films generate characters, stories and buzz that filter through the rest of the Walt Disney business. 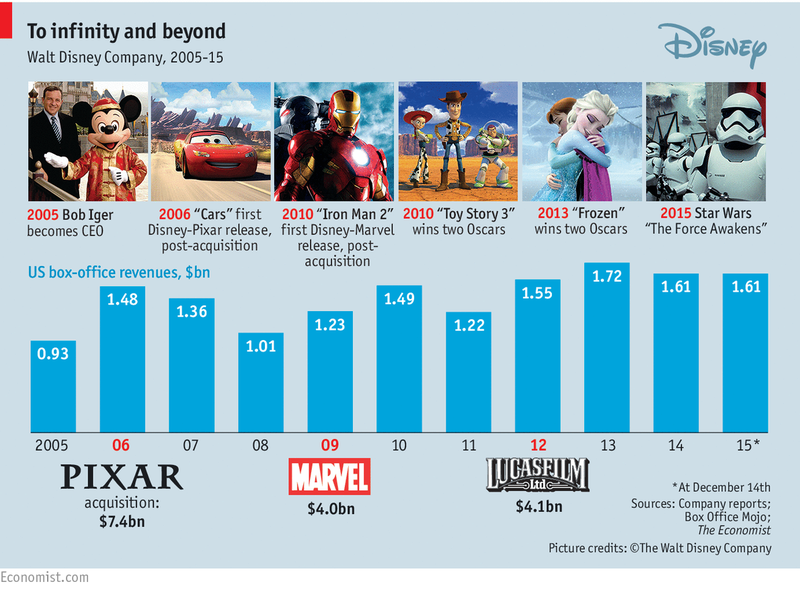 But financially, Disney’s film business is the third largest at the company. 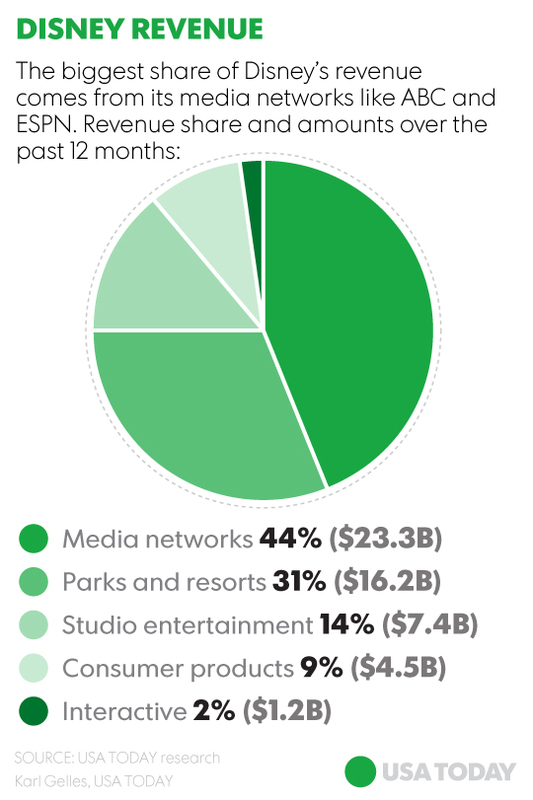 The filmed entertainment business accounted for 14% of Disney’s revenue over the past 12 months. The film portion of Disney’s business ranks below its Media Networks business (at 44%) and its Parks and Resorts business (at 31%). The small relative size of Disney’s film business explains why every extra $100 million in “Star Wars” box office only adds 2 cents a share to Disney’s fiscal 2016 earnings per share, according to Goldman Sachs. Rising attendance, admission prices and expansion in the Parks and Resorts business is turning the business into the single-most important part of Disney to investors. One analyst estimates that 31% of the Disney’s stock value is attributable to its Parks & Resorts business – more than any another part of the business. I just saw a pre-release screening of Pixar’s THE GOOD DINOSAUR that opens this week. The film took a long convoluted path since 2013 that finally ended with the studio allowing it to see light of day theatrically. 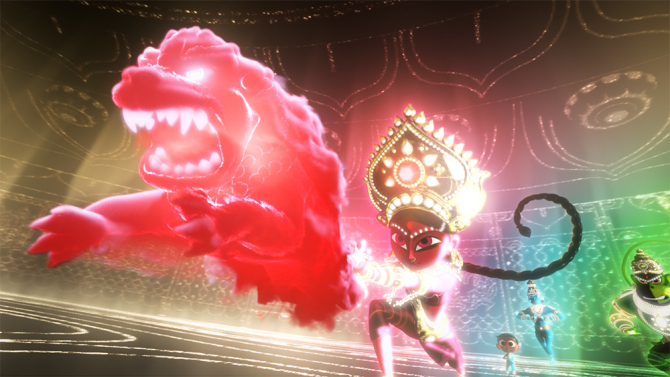 The film screens along with a pretty spectacular new Pixar 3D-Short, “SANJAY’S SUPER TEAM, created by longtime Pixar artist Sanjay Patel who makes his directorial debut with this “semi” autobiographical film of an Indian-American boy fantasizing about the similarities between his favorite TV superheroes and his father’s Hindu gods (More on this cool film #D short in the review). The characters and the plot-line in the The Good Dinosaur are quite similar to those Pixar visited so many times before, and so is the formulaic “find your courage” plot line. It simply retreads a lot of well-worn narrative and thematic ground in that respect. 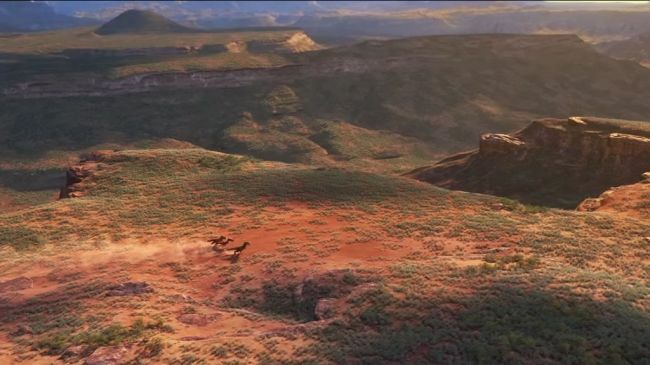 The real story about THE GOOD DINOSAUR is the fact that Pixar broke new computational ground in the re-creation of some truly amazing (and real) landscape imagery never before seen in such resolution, clarity and authenticity. A lot to write about here. But first a little bit about the film itself. One of the biggest surprises for me about The Good Dinosaur is that it is actually a Western. It begins with a near apocalypse 65 million years ago and an asteroid racing toward Earth. And while that’s around the time, that dinosaurs became extinct, the film hypothesizes a story with alternate-timeline premise. What if the asteroid that killed off the dinosaurs had missed the Earth? What if they had zipped right past the planet, creating a false alarm instead of an extinction level event? “What if the dinosaurs didn’t get wiped out with a meteor?” And, millions of years later, primitive humans and dinosaurs coexisted? The Good Dinosaur presents a world where people and dinosaurs coexist, but also where the latter has become the dominant intelligent life-form. We see dinosaurs and other talking animals interacting with a feral human, and the film implies that absent the pesky meteor dinosaurs would have perhaps evolved enough to engage in agriculture. While humans scamper around on all fours, their language a primitive series of grunts, the dinos speak impeccable English, wield tools, and tend to crops. Our hero is a young Apatosaurus named Arlo (voiced by Raymond Ochoa), runt of his litter and the underachiever of his folksy farm clan. Arlo wants to “earn his mark,” to meet the expectations of his patient Poppa (Jeffrey Wright), but he can’t seem to overcome his anxiety. Thankfully, there’s nothing like a little adventure—coupled with some parental loss, a signature of Pixar’s parent company since Bambi—to instill courage in a plucky talking animal. Swept up in a rapid river and deposited miles from his home, Arlo has a dangerous voyage ahead of him. Separated from his family as they struggle to bring in the harvest (winter is coming! ), Arlo finds himself alone in the wild until Spot becomes his protector and friend as they try to make their way back to Arlo’s family. Arlo will need to overcome his fears if he’s to make it home. His only steady companion: a feral human child whom he names Spot (voiced by Jack Bright, who only grunts and howls but never actually speaks words). Spot becomes his protector and friend as they try to make their way back to Arlo’s family. Arlo will need to overcome his fears if he’s to make it home. While they start off more as adversaries (at least Arlo has a very specific reason to be angry with Spot), the two eventually become best friends as they traverse the unforgiving and often terrifying wilderness of prehistoric America. Along the way, the duo encounter religious zealot search-and-rescue pterodactyls, T-Rex cowboys, and raptors who rustle the T-Rexes’ herd of primeval longhorns. Mother Nature is also as much of an enemy here as any of the bad dinosaurs. Spot is alone in the world, but he’s fearless and a survivor, qualities that inspire Arlo. Their bond is the best part of the film, and, with his dog-like antics, Spot steals every scene he’s in. It’s adorable and hilarious. You believe in the bond between these two, and the movie’s final moments will generate enough feels to make even the most stoic adult choke up. There are moments where the film can be genuinely terrifying — enough so that it may be too extreme for very little kids — with death always right around the corner. The Good Dinosaur certainly doesn’t shy away from the ever-present mortal dangers of prehistoric times with more than a few deaths (some played for laughs, others not) occurring along the way. To say more in this particular case would be to spoil things. On a technical level, The Good Dinosaur is gorgeous-looking, especially its photo-realistic imagery. Never before have water and landscapes looked so real in an animated movie. This is a visually dazzling animated feature, with photo-realistic backgrounds effortlessly merging with somewhat more conventionally cartoonish animal characters. Perhaps more than ever before, the animators do the heavy lifting: Every detail, from the gentle bob of a beast’s breathing to the fluid shifts of Spot’s facial expressions, has been lovingly rendered. And that’s to say nothing of the few set pieces, the most striking of which finds the fins of psychotic pterodactyls—the movie’s villainous flock—ominously dipping down out of a cluster of storm clouds, as though the sky itself was shark-infested waters.. The film is at once an enormously sophisticated visual achievement—just look at the way water ripples, the way light bounces, the shots of raindrops bouncing off leaves and clouds curling around rocky ridges here that look like real-world documentary footage. There is great beauty in every frame. While the realism allows Pixar’s artists to flex their graphical muscles in a very different way to, say, the fantastical landscapes of Inside Out, it’s also vital in cultivating the palpable sense of danger that pervades the film. The film’s stunning locations set in Jackson Valley, the Grand Tetons & Yellowstone were created using terrain mapping technology to capture the actual geometry of several areas found in the American wilderness. As the camera pulls back further and further, our heroes become tiny specs on an enormous canvas. 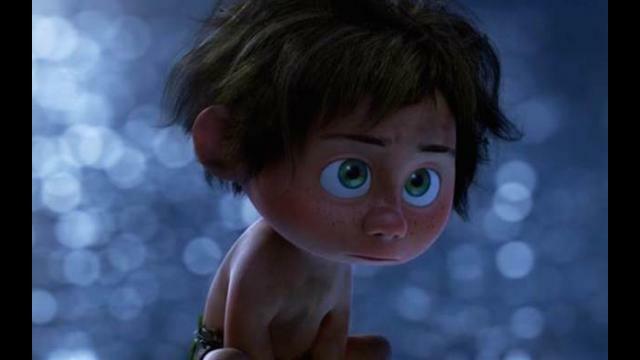 Sohn and his Director of Photography, Sharon Calahan, felt that realism would really make the characters, Arlo specifically, pop off the background. To help achieve the stunning backgrounds, Director Sohn and his team downloaded United States Geological Survey satellite photos of 65,000 square miles of the northwest, along with their topographical data. When inputted into their computers, this gave them a 3D environment that could look out over 50 miles into the distance. The United States Geological Survey has satellite photos of all of North America along with typographical data for the height. To accomplish this near-impossible task, the set team used actual USGS data of the northwest United States to create the sets in the film. They downloaded the terrain for Wyoming, and using the Survey’s height data and satellite images from Google Earth, they were able to bring Arlo into the landscape they had just seen. The geographical data povided a foundation the team could then build on, first with vegetation, dirt and water. It would take time to texture and populate the environment with vegetation, but the result was a lot of bang for very little buck. They even used that data to conduct digital virtual location scouts — Pete Sohn would “visit” the locations using the virtual topographical locations created from the data and chose the locations needed for each sequence of the film. 64,600 square miles of North America were downloaded and adapted to help tell Arlo’s story. The river that takes Arlo away from his home was modeled after the Salmon River in Idaho. The desert where Arlo meets the T-rexs was modeled off of Zion National Park. As a test, Pixar’s set team downloaded the information and took a famous Ansel Adams photo and applied the data to where the photographer would have taken the image. The result was miles and miles of 3D geographic environment. They kept the scale of the environment, but they chose different types of trees and such to suit the scene. They would also alter the data to fit their story, turning real-life locations into fictional ones. While all this data looks beautiful (and it really does), it also took up a lot of space and time. The landscapes gobbled up 300TB of server space, 10 times the entirety of Monsters University. This is on top of the over 900 visual effects shots (which include the movements of the river, rain, smoke and clouds), twice as many as have ever been used in a Pixar movie. Just one sequence of Arlo getting swept away by a river has more data than all of Cars 2. The Good Dinosaur’s water effects in particular are staggeringly detailed — the river running alongside Arlo’s journey has more character than 90 percent of the cast. At one point, a semi-conscious Arlo lies in the river’s shallows, while light plays across the ripples in the water, partially obscuring the multicolored rocks below. In that moment, the water is beautiful enough to completely distract from the distressed protagonist lying in it. When the river roils in a rainstorm, or relaxes into a deep, still pool, it’s hard to tell that the film wasn’t shot in live action. And the fantastically detailed trees and grasses of the mountainside Arlo and Spot traverse are just as stirring. If humanity successfully pollutes all the world’s water, kills off the greenery, and breaks every mountain down for oil, future generations can lie in their dwelling-tubes and watch The Good Dinosaur alongside films like The Searchers and Shane to remind them exactly what the wide-open spaces of the American West once looked like. Over 900 effects shots were created for The Good Dinosaur, twice as many as Pixar has ever done in a feature. The effects department is responsible for providing many of the natural phenomena you see onscreen: smoke, fire, fog, water, etc. Motion is important to the effects department to give you a sense of scale, timing and weight. For instance, the way snow mists in the wind off the top of mountain might reflect the mood of the scene.They use physics simulation software, using different toolsets for different problems. The software solves equations of motion for every frame of an effect, as it understands the physics of how things are supposed to move and behave. Pixar has also updated the technology used to create clouds in the film, ditching the ‘sky matte’ paintings that are traditionally used in animated films in favour of realistic digital clouds made of millions of particles – this volume of ‘thinking particles’ is particularly useful for a scene in which Arlo tosses Spot up through the clouds while running along the ridge of a mountain. They wanted to create 100% volumetric clouds or the first time. Usually Pixar just paints clouds into sets, but by creating a new cloud library, Pixar would be able to light them and insert them in many scenes. This was particularly important for stormy scenes. From the rapid river that sweeps Arlo away to the towering mountains he must learn to climb, much of the set of “The Good Dinosaur” looks so real it feels more like a photograph than animation. There are shots of raindrops bouncing off leaves and clouds curling around rocky ridges here that look like real-world documentary footage. One of the greatest challenges for the team was a river sequence in which Arlo is swept away. The film features more than 125 shots of the water alone, more shots of water than in any other Pixar film. To achieve this, the effects team broke down the river into different pieces, and then repeated those pieces. While on these travels, the team lived the fantasy they were trying to create. They rode boats down rapid, winding rivers and went on a horse riding expedition. During their boat ride, they lost the GoPro camera that was capturing their journey. Luckily their guide later retrieved it, and the team was able to use the solo footage of the river. Sanjay Patel’s Sanjay’s Super Team short cartoon that precedes this film is pretty spectacular. 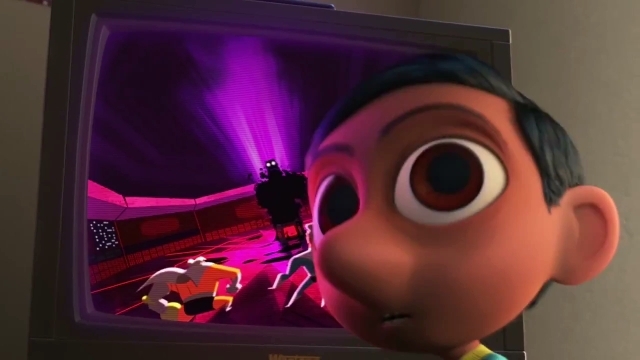 Longtime Pixar artist Sanjay Patel makes his directorial debut with this “semi” autobiographical film and was partnered with Pixar producer Nicole Paradis Grindle. A little boy races to the TV for cartoons only to be called over by his father for Hindu meditation. 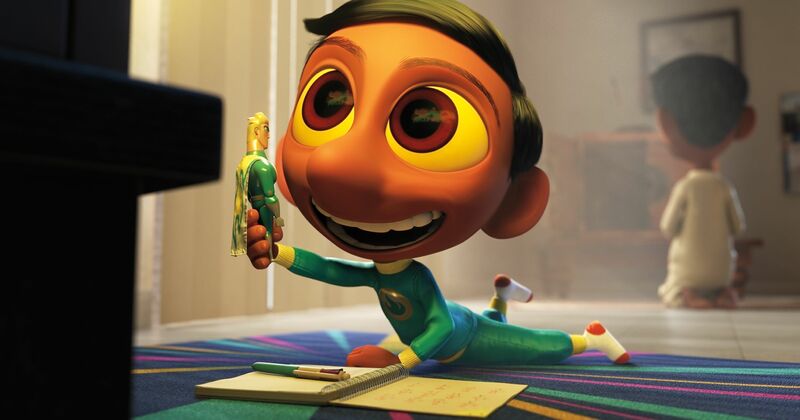 While it’s a big deal that the movie represents Pixar’s move to show more diversity in their storytelling, it also happens that Sanjay’s Super Team is a visually interesting, exciting, and heartwarming film that will likely win audiences over from the minute Sanjay bounces on-screen with his action figure. 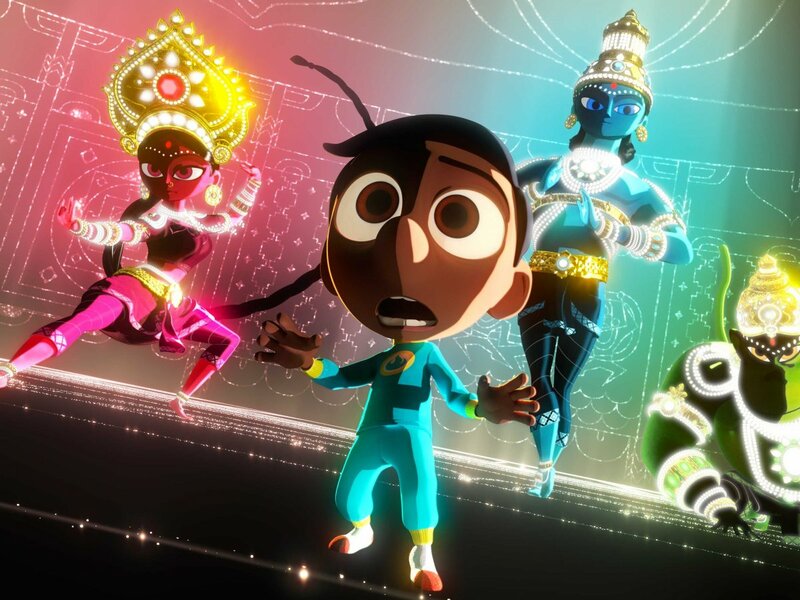 The “mostly true story” of an Indian-American boy fantasizing about the similarities between his favorite TV superheroes and his father’s Hindu gods is helmed by first-time director Sanjay Patel, a Pixar animator since A Bug’s Life, it’s a personal story about how he related to his father and his family’s culture as a child. It’s a fast-paced, dynamic superhero throwdown, full of Tron-worthy, bright, glowing colors and a tremendously effective sound design. It’s sweet and intense. According to Sanjay Patel: Personally, I’ve done a lot of research and study of Hindu culture and find the myths to be very inspiring and appreciate how sacred they are to my dad and his friends. So going in, I knew exactly what we had on our hands. So each deity was carefully constructed and we paid close attention to the details, to make sure they were respectful. But it was also fun to think that we were introducing some people to them and showing why they are significant and how they are different. Why Vishnu is blue but Hanuman is green? And we made and thought about all those specific choices, because we knew right away that if we didn’t, we would upset some people. We just wanted to be faithful to the mythology. But from there, we wanted to form some connections which might have gone overlooked. In India, these classical myths are performed all the time, often in theater or dance. So we drew upon those traditions. We brought in an expert who had studied traditional dance in India, and taught our animators how to be specific in the deities’ movement, because we don’t use language in the film. So each deity was assigned a specific dance tradition. So we tried to give each layer an interesting way of introducing this culture to people who may have no knowledge going into the theater. With every new Pixar movie not only comes the excitement of new family movie, but the appetizer of a new short. With the release this week of The Good Dinosaur comes one of the best shorts in recent years: Sanjay’s Super Team. A little boy races to the TV for cartoons only to be called over by his father for Hindu meditation. Yes, it’s a big deal that the movie is Pixar’s move to showing more diversity in their storytelling, but it also happens to be a visually interesting, exciting, and heartwarming films that will likely win audiences over from the minute Sanjay bounces on-screen with his action figure. Longtime Pixar artist Sanjay Patel is making his directorial debut with this “semi” autobiographical film and was partnered with Pixar producer Nicole Paradis Grindle. Lesley Coffin: You put in right at the beginning that the movie is “based” on a true story, so I’m just curious what part of the story was inspired by your real life? Sanjay Patel: The initial pitch was actually something completely different, and didn’t really have anything to do with family. It was just about a kid who wasn’t appreciating his culture and absorbed in comic books. Nicole Paradis Grindle: A generic kid from India right? Patel: Yeah, and the premise was just about a kid appreciating his culture. And as I was telling the story, I showed this drawing I had, which illustrated the way I grew up with my dad. And I told John Lasseter a little bit about how I grew up, and that every morning, my dad would get up in the morning and worship his gods, while I would worship mine on TV. And I had this one drawing that really illustrated that, and straight away, John said he loved the idea about a movie about a kid not appreciating his culture, but he also really loved the idea that through appreciating your culture, you can build a connection with your father. And that was absolutely true of my own story and isn’t something we had to manufacture for this film. It took be 30 years to get here, but it is definitely based on a true story. TMS: I know you’ve both worked at Pixar for a while, but this being your first time directing, how did you partner up and create the team for this film? Grindle: They just kind of put us together because I was available. Perhaps it was kind of by design but no one told us that or gave us a reason why. But it has turned into a great partnership. We really get along well and I was very passionate about the story and bringing his vision to the screen. It’s a great story and I am personally someone who gets excited about seeing new and fresh voices on screen, and that includes having more ethnicity and women in leadership roles. So this project certainly resonated and we had a good relationship right away. TMS: Had you ever worked on a film together? Grindle: We have both worked on the same films, but in the past, Sanjay has always worked on animation or was part of the story team, and I was always in a different department. So this was our first time really working together. Patel: But I’ve seen all of Nicole’s work growing up. I was obsessed with the shows she worked on at Liquid Television, like Æon Flux. And of course Roger Rabbit, which is one of the seminal movies of my childhood. Grindle: I can take no credit for that movie. The production assistant takes no credit for that film’s success! I never thought I would work in animation until I did that movie, and then I just fell in love with the world of animation and all the people that work in that world. TMS: Father and son are so instantly endearing and sweet, because they aren’t hyper-realistic human characters, but they also have some very realistic features, like the design of their eyes. How did you decide on the character’s design and style? 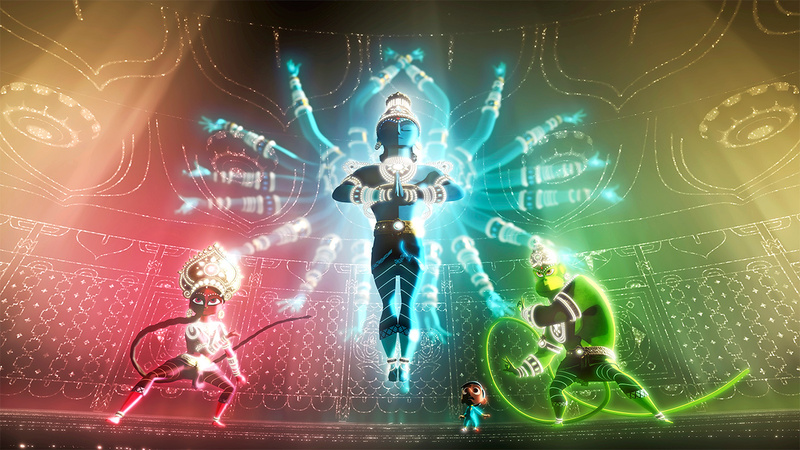 Patel: There was a lot going on when we were thinking about and designing those characters. One of the big things were concerned about was how to link the designs of essentially the two worlds together, and show a connection between father and son with their features. But we also wanted to create a design aesthetic which felt universal for all the characters. 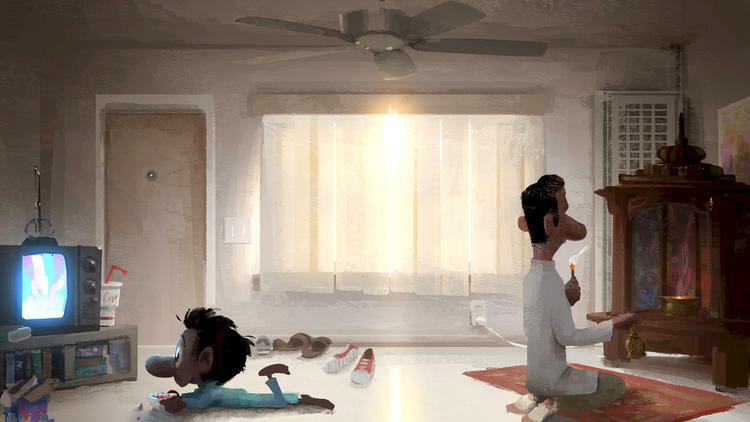 Initially we designed father and son in isolation from the deities, but then John Lasseter came in and suggested finding something to unify all the characters. So our art director looked at classical Indian sculptures and saw that many have these beautiful eyebrows and noses which give the eyes an almond shape. So we used that to unify the characters. TMS: Whenever doing a film that deals with religion, you have to consider how respectful you are compared to how much freedom you have, but with this film you also had to make the film both playful and informative for kids. How did you determine the approach you would take on this film? Patel: Personally, I’ve done a lot of research and study of Hindu culture and find the myths to be very inspiring and appreciate how sacred they are to my dad and his friends. So going in, I knew exactly what we had on our hands. So each deity was carefully constructed and we paid close attention to the details, to make sure they were respectful. But it was also fun to think that we were introducing some people to them and showing why they are significant and how they are different. Why Vishnu is blue but Hanuman is green? And we made and thought about all those specific choices, because we knew right away that if we didn’t, we would upset some people. We just wanted to be faithful to the mythology. But from there, we wanted to form some connections which might have gone overlooked. In India, these classical myths are performed all the time, often in theater or dance. So we drew upon those traditions. 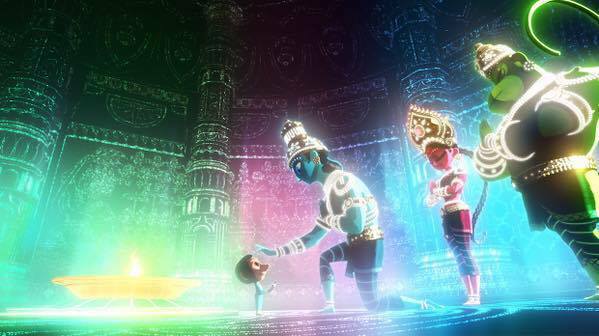 We brought in an expert who had studied traditional dance in India, and taught our animators how to be specific in the deities’ movement, because we don’t use language in the film. So each deity was assigned a specific dance tradition. So we tried to give each layer an interesting way of introducing this culture to people who may have no knowledge going into the theater. Grindle: But in a respectful way. We were so aware of those concerns, and didn’t want to do anything which might make those deities look too cartoonish or too much like the superheroes on Sanjay’s TV. That was parallel we drew, but we don’t want anyone to say they are just like superheroes. These are deities and we want to honor them. TMS: The deities’ have that stream of light which makes the action sequences feel so unique and graceful in a way we haven’t seen before. Was that part of the reason you chose to look at dance traditions? Grindle: We were talking about incorporating something which made things feel almost cosmic and infinite. And Sanjay is a big fan of Anime so he drew from those influences, but we also talked about everything from the Arora Borealis to an image from 2001: A Space Odyssey. And with all that brainstorming with our team, we found a way to turn that old, gray temple into something where the walls seem to melt away and turns into this cosmic space. We wanted to experience the transformation from something feeling enclosed and dark to something feeling light and beautiful. Really create a sense of the celestial realm on screen. TMS: How familiar were you with Hindu culture? Grindle: Not very much at all. I think I came at this from a very typical white, European background. I knew something of it, but very little. I’ve learned so much doing this film and found that part of it to be really enjoyable. I found there is so much depth that I never knew about before, and just hope other people from a similar background are inspired by this film to learn more. I’m sure a lot of people will go in saying “I don’t know about these deities” but want to learn about them. And they are just the tip of the iceberg. TMS: You use the superhero connection in the movie as the little boy’s entry point into understanding what his dad is talking about. But when you were growing up, did you have any kid friendly things to teach you and get you excited about the Hindu religion? Patel: I was born in the UK but raised in LA, so I kind of had three level of removed. And the community in LA was still pretty new. There wasn’t even temple nearby. But in the 70s, there were some comic books published called Amar Chitra Katha which means Immortal Stories or Golden Stories. But they were kind of frozen relics from the early 70s, but just kept in circulation because there wasn’t anything else out there. I mean, they aren’t X-Men comics, so I was sort of like “boring.” But it was crazy when I finally got a job at Pixar, the church of modern day storytelling, and felt moved enough by these myths to want to tell them in a way so a kind like me in a culture like this could appreciate them. That was a huge motivator for me, because those comic books I had as a kid were terrible and did not get me interested. I can appreciate them now as an adult, but certainly not a kid. Grindle: But most religions have those entry points for kids or kid friendly version of the stories, but it doesn’t sound like that exists in Hinduism.